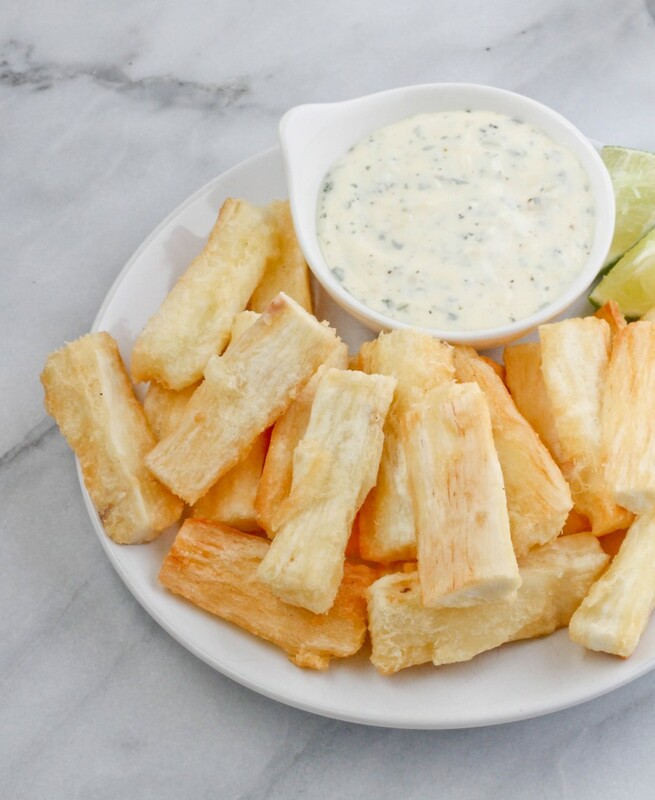 Cassava or yucca is a staple in many countries in the Caribbean and South America. It is a starchy root that has a mild flavor and can be used in many ways similar to potato and can be bought fresh or frozen. The most difficult part about cooking cassava is removing the tough outer peel but with a bit of practice it’s fairly easy. The frozen cassava is already peeled but I will link a video on now to peel it for those of you who are using fresh. Cassava is gluten free so it’s perfect for those who are gluten sensitive. I love cassava and my favorite way to eat is in metemgee but this is easily a close second. 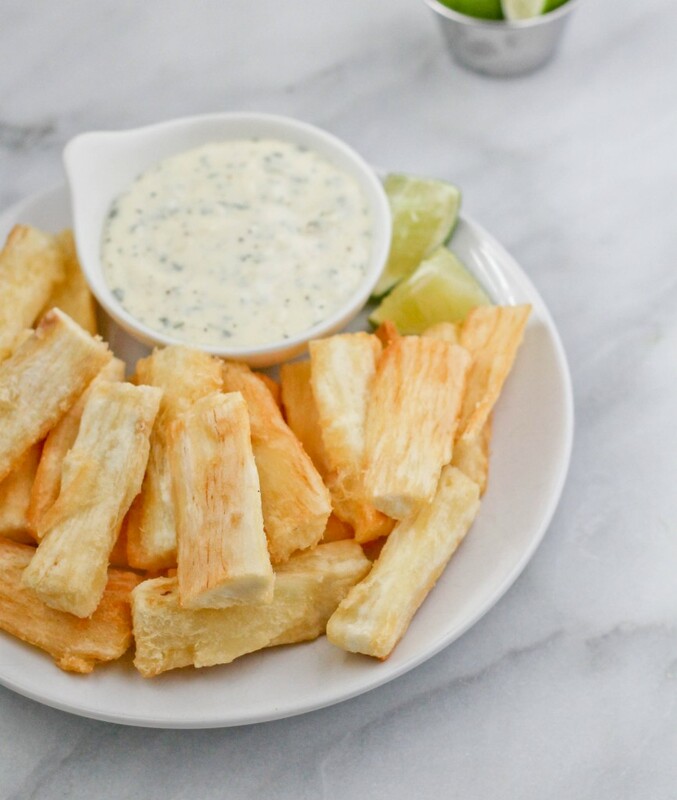 The cassava is boiled then fried until golden and crispy; once you bite into the fries it reveals a light fluffy middle. These are seriously addictive and the garlic dip is amazing!! 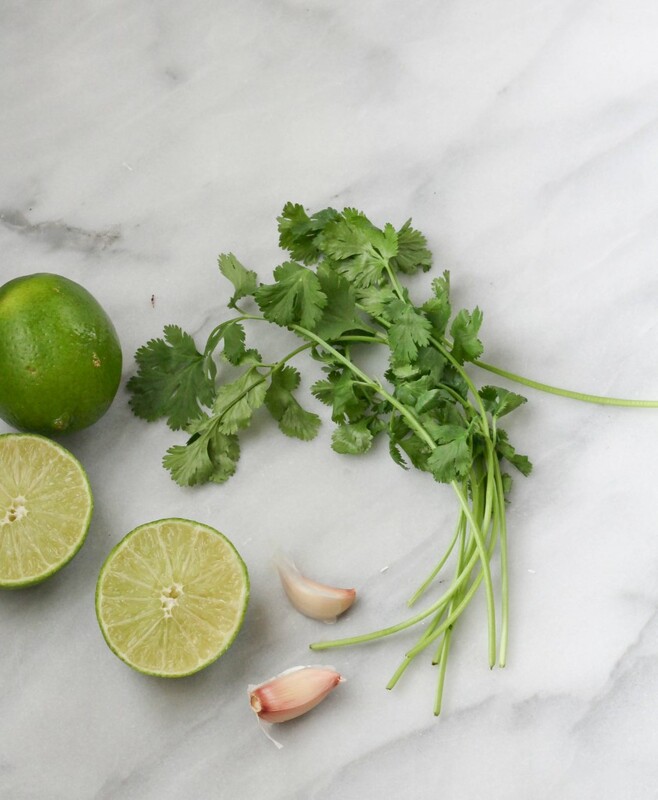 To make the dip, place all ingredients in a small bowl and mix to combine. Place in the fridge for an hour for the flavors to blend. 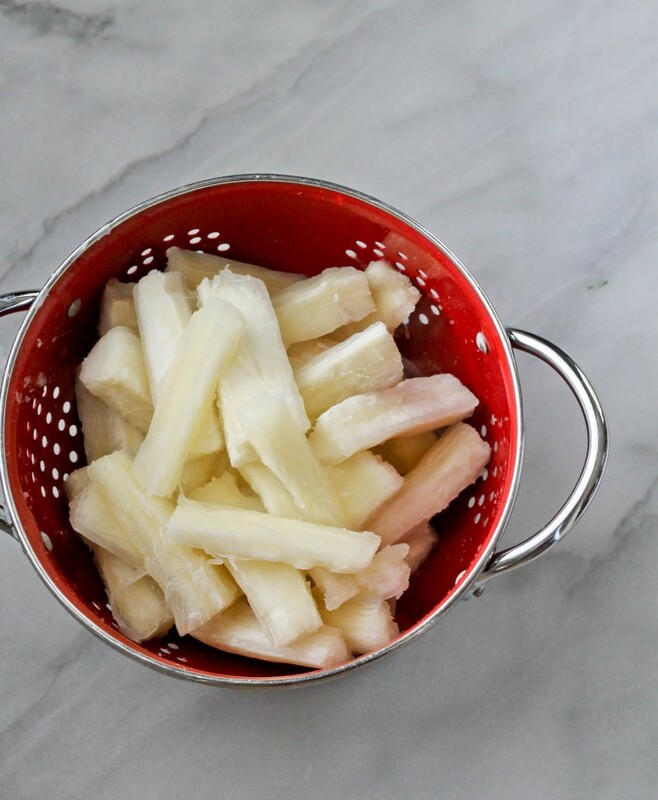 To make the fries, place the cassava pieces in a pot with enough water to cover and bring to a boil. 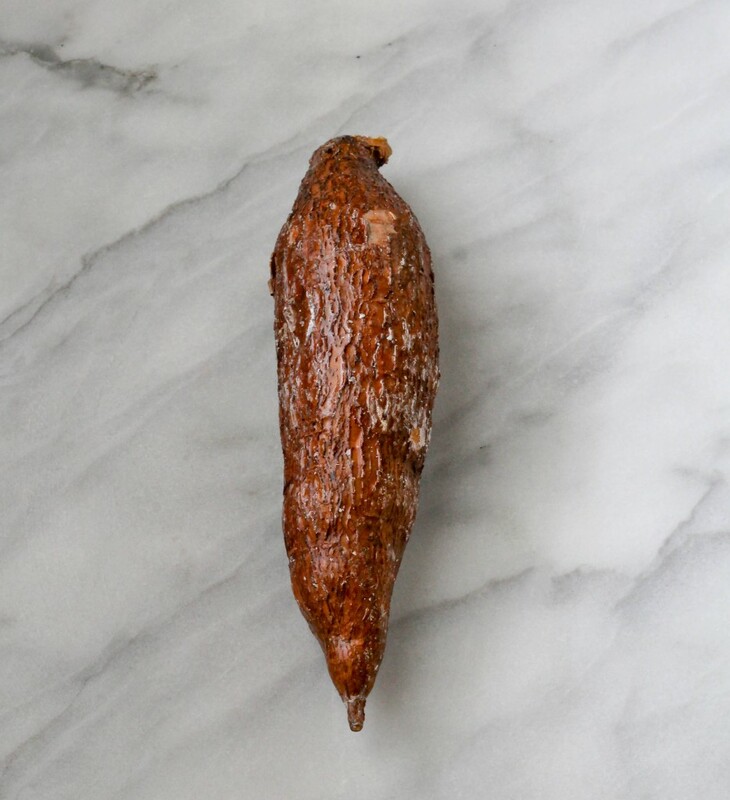 Cook the cassava for 5 minutes after it comes to a boil then remove from heat and drain. Spread in a single layer on a kitchen towel or paper towel and allow to cool and dry. In a heavy bottom skillet place oil about 3 inches deep and heat over high heat. When oil is hot, place fries in a single later and cook until golden brown on all sides. Remove from heat and place on a plate lined with paper towel to drain the oil. Serve with the garlic mayo dip. Enjoy! 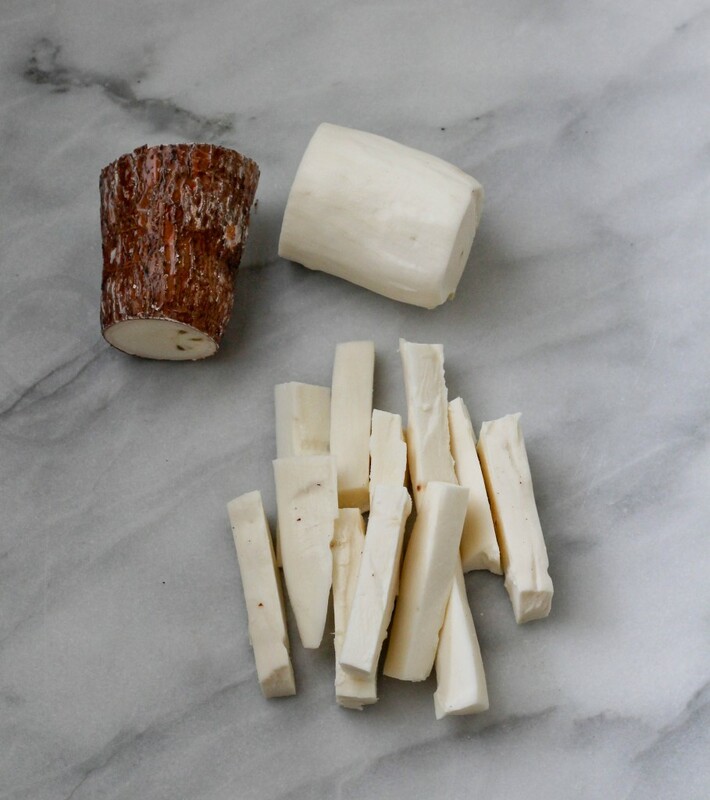 When cutting the cassava, there is a stringy fiber that runs down the middle that’s visible. Cut that away and discard. Cassava varies in cooking time so pay attention to the outside. If it begins to break down too much while boiling then drain immediately. 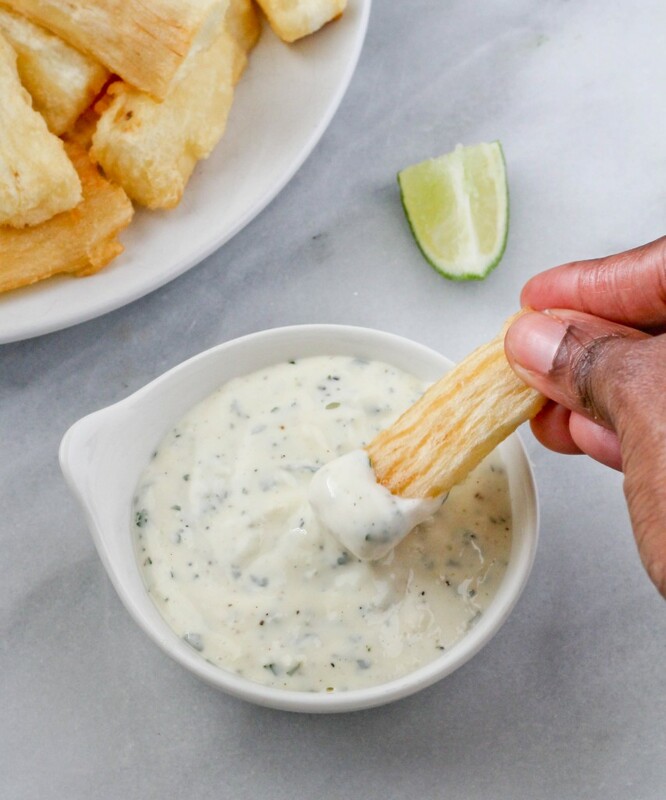 I love cassava in every kind of cooking method and this has become one of my favorite one,thanks for the dip,this makes it better.